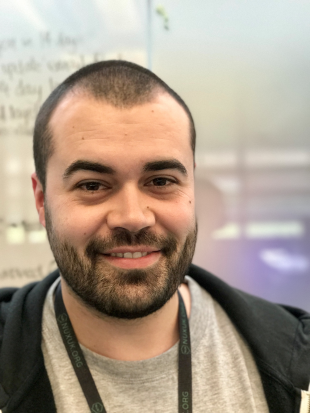 I’m Craig Abbott, an interaction designer based at DWP Digital’s Newcastle hub. Since joining DWP in 2015, I’ve heard people mention how hard it is to book a meeting room. Something that should be so simple is often a series of frustrating workarounds. First, we used a Confluence calendar. This was difficult to understand at a glance, and because of this rooms would often end up double-booked. This led to awkward interruptions and wasted time for teams. After the Confluence calendar, we moved to an off-the-shelf solution that looked promising. However, we quickly realised this excluded many people; not everybody was trained to use it and not everybody is connected to the same network. This solution also depended on Microsoft Outlook, something MacBook users don’t always have access to. This led to some people moving away from using it and the rooms effectively becoming a free-for-all. It also led to an influx of people from other teams or different buildings using the rooms. The next solution was a spreadsheet in a shared drive. This reduced double bookings but brought its own problems. The shared drive again isolated people on different networks. And if somebody forgot to close the spreadsheet it would get stuck in read-only mode, locking everyone else out. Complex Excel macros were then introduced to try to detect when the spreadsheet had been left open and then close it down automatically. All very complicated. So we began to think about building something better. A core team of designers, developers, delivery managers and business analysts got together, joined throughout the day by other people dropping in and out. The event brought the whole hub together and really helped us tackle the problem in an agile way. We discovered the user needs so we could build a proper backlog of things to do. We also found that the hub management team need to make sure that people who work in the building have priority when it comes to booking rooms. People who work outside DWP are welcome to use the service to book rooms in Newcastle, via the hub management team. Once we had the user stories we started to prototype some ideas. By the end of the hack day we had something that we thought would work. We presented this back to the hub as a show-and-tell, gathered feedback and then turned the prototype into a web application. Just a couple of days later it was handed over to the hub management team so that people could start using it. 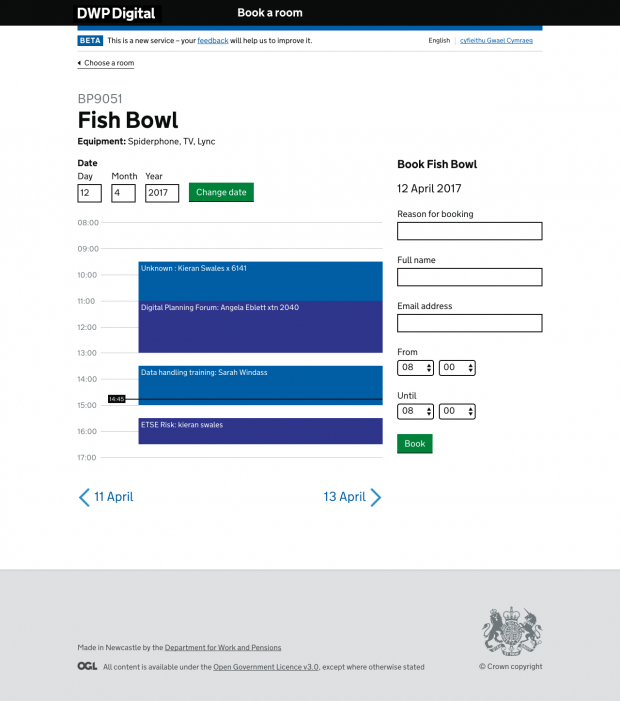 Our custom-made booking system is now being used here in Newcastle, and we are collecting feedback to help refine the backlog. Based on this insight we have already published one iteration since going live. Now we’re working on the next feature and have been collaborating with the analytics team to try and build up a better understanding of how people are using the application. We are also trialling a door display to let people see the availability of rooms in real time. This was built as a separate web application and installed onto a Raspberry Pi. Since the new system went live, we’ve definitely noticed fewer people sheepishly backing out of rooms after walking into the wrong meeting. All of the code is open source. It’s hosted on GitHub, so hopefully more people will be able to contribute and meet even more user needs. If you’re interested in the technology and code behind the system, there will be a follow-up post covering the application in more depth. 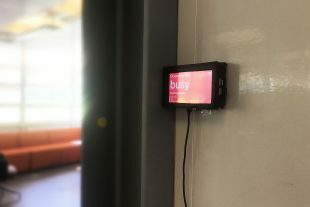 In the meantime, you can see what we’ve been doing with the booking system, the supporting application programme interface (API) and the Raspberry Pi display on GitHub.